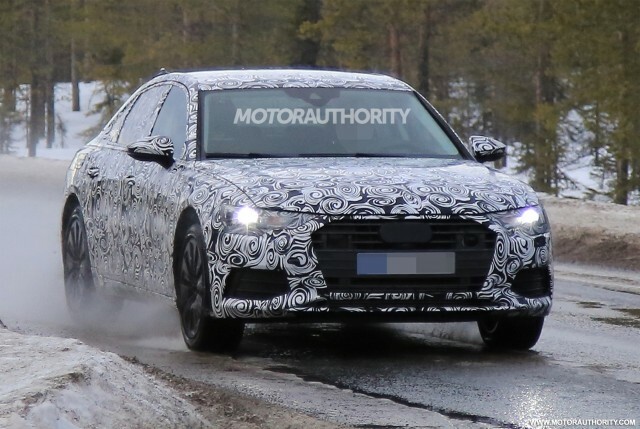 A prototype for a redesigned, fifth-generation Audi A6 has been spotted for the first time. The car is being developed alongside new generations of the A7 and A8 with which it will share much in common. The A8 will appear later this year as the first arrival. It will be followed in quick succession by the A7 and then the A6. Sales of the A6 are expected to commence sometime next year, meaning we should see it arrive as a 2019 model. The platform is the latest evolution of Audi’s MLB design for front- and all-wheel-drive vehicles with longitudinally-mounted engines. It promises some weight savings as well as new plug-in hybrid options. The current A6, despite featuring some aluminum in its construction, still weighs over 4,000 pounds in some guises. As for the styling, Audi’s Prologue concept unveiled at the 2014 Los Angeles auto show points the way. The wide, imposing grille and strong creases are lifted straight from the concept, as are the geometrically-shaped headlights. The base engine should be a turbocharged 2.0-liter inline-4 delivering 252 horsepower. Above this will likely be a V-6 and as mentioned earlier we should also see a plug-in hybrid option. The latter will feature Audi’s “e-tron” badge. Note, the current A6 has a plug-in hybrid option, though only in China. The good news is that we can also expect new versions of the performance-oriented S6 and RS 6. The RS 6 should stick with a twin-turbocharged 4.0-liter V-8 possibly matching the 605 hp of the current RS 6 Avant Performance. It’s not clear at this point if the car will be offered as a sedan or if it will make it to the United States this time around, but we have our fingers crossed.